A postdoctoral fellow in cell biology at The Hospital for Sick Children Research Institute, Dr. Vanessa D’Costa was awarded a L’Oréal-UNESCO Women in Science Rising Talent grant for her research into mechanisms that allow salmonella bacteria to escape the immune system. Salmonella is one of the leading causes of food-borne gastroenteritis worldwide. Severe cases of salmonellosis can cause death and contribute to the development of reactive arthritis, an autoimmune disorder. Recent years have seen an increase in infections by drug-resistant salmonella. Salmonella bacteria cause infection by evading the immune system with the help of toxin-like proteins called effectors, whose function is not fully understood by scientists. Dr. D’Costa’s research aims to determine how these effectors manipulate host cells and enable the pathogen to bypass the body’s disease-fighting systems. Her findings will provide insight into the functioning of other drug-resistant bacteria and, more generally, our understanding of the immune system. Dr. D’Costa was earlier awarded a Frederick Banting and Charles Best Canada Graduate Scholarship from the Canadian Institutes of Health Research while completing her PhD at McMaster University and a Banting Postdoctoral Research Fellowship at the University of Toronto. 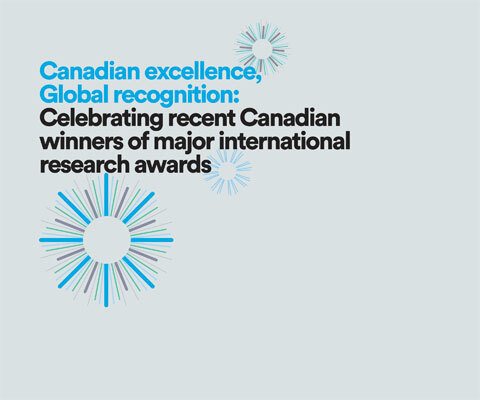 * Vanessa D’Costa is one of 24 Canadian winners of major international research awards in 2015 featured in the publication Canadian excellence, Global recognition: Celebrating recent Canadian winners of major international research awards.